An instant New York Times Best Seller! BRAVO! A masterpiece of a book! Everyone really should read this book and experience what it has to offer each of us as individuals. 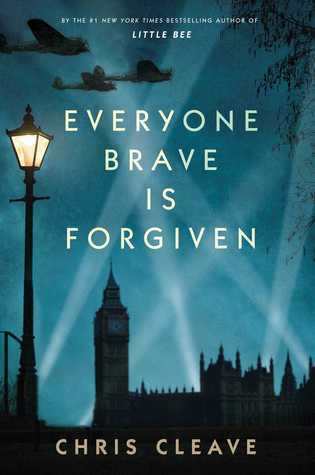 Bravo to this author, Chris Cleave, for portraying this book about WWII that couldn't have been more real, honest and raw. Please know, though, that this book is far from fun and does not give us, nor is it meant for a happily ever after ending, however, I was still flipping through the pages very quickly because I wanted to know what was going to happen next! War is not pretty, though, not at all. This is NOT a spoiler, but the title of this book is very important, and you'll only know why as you near the end. Please, do NOT read the end first. Experience this book in it's entirety, first. You will understand it much better after you read this in full, first. This author has succeeded in bringing the reality of WWII into our lives/our homes, even though it's been over for decades now. This IS one war that had so much of an impact to it that I don't think anyone will ever forget all the different things that happened. Some of us have been very lucky to have had relatives and family friends be able to give us a little glimpse into this war, but it is Cleave who shows us how very real this war was, and how it affected every single person at that time, and still even to today when we learn about it in school and later as we watch documentaries, or when we learn they have found new information about this war, and learn even more information as it is uncovered as time goes on. There was a lot of loss which was very sad. I felt as if I were involved in this war as much as Mary, Tom, Hilda and Alistair were, the four close friends in this book who all fought along with everyone else who was involved at the time. We are lucky enough to get to know these four very real, complex, and unforgettable characters who literally lived through the hell of war. I found myself having to put this book down several times because I felt like I was living in this war. I felt as disturbed as the characters did at times. When you hear discussions about Post Traumatic Stress Disorder, it is clearly shown how it can happen. I admit if I had to serve in a war like this, I definitely would be suffering from it. Cleave does a very good job of making us feel how deeply this war affected people with the characters that told us their stories of what they lived through, worked through, and experienced the numerous losses they did of very close friends. This teaches us to appreciate what we truly have now, and what we fought for then. I don't think anyone reading this book will ever feel or think the same way about war again as the author made this so realistic. He truly did an outstanding job of portraying the war for us with two of the main characters, in particular, Alistair and Mary. They were the ones telling us this story in alternating chapters. Mary stayed in London and worked through most of the war as a teacher. She taught the misfit children, the children who were left behind in the city. The children who other people thought had no future, and it was so bad the way they treated these children that they removed the zoo animals and left these children to fend for themselves. The black children were called negroes at that time. Remember this war took place in the early 40's, so racism was still very present, even in London. The other children were disabled, had problems, were lost in the foster care system, etc., (and no one cared enough to stay behind during the bombings to care for these kids) while the children who had parents and money were swept off to the countryside and were kept far away from the city of London's bombings. This was so wrong. They deserved just as much to be kept safe. I say these children who were left behind were the brave children as they lived through the bombings, buildings falling down all around them, lived in a broken concrete city, and the severe hunger that came with the bombings. These children were the true heroes, and yet through all of this, they still went to school and Mary continued to teach them even through the air raids with the sirens were going off, as long as they were in somewhat of a safe place underground. The children and Mary watched their city turn to rubble all around them as each day went by. Later Mary and Hilda, together, worked as ambulance drivers trying to save the injured and their lives experiencing the war even closer, right in the middle of the action. Tom and Alistair went off to war, each to their specified locations. We learned a lot about the Island of Malta, where Alistair was located. He lived through constant bombings from the Italians there. They got air raids and since they were on the water, the enemy came by water and planes, both. The sirens warning of the air raids were continuously going off it seemed on the Island of Malta and in London. The problem with the island of Malta was it was pure yellow rock. You could not dig deeper than five or so feet deep. The water you drank had the dirt/sand from the island in it and your eyes always felt scratchy for the same reason. The bombings were so many that Alistair and his men could not even have their own relief planes bring in the supplies of food, water, mail, or the ammunition they needed to try to fight with to survive. They had to start to count how many rounds of ammunition they could use for each air raid, and how many more could they take without being replenished? The hunger set in. Alistair made note of the men's ribs and bones showing through their skin they were all so thin and starving. The death of fellow fighters was numerous, and if one of them were a friend of yours, it stayed with you and haunted you. This was despair. Alistair often thought about home, wondering if he would ever live through what he was to get off this island and get back home. Who would be left when he did get back there? Mary had been writing letters to him, but then they stopped. Why? At least he had her letters to hold onto, to know that life still existed off of this island even if these letters were old news now. I have only covered a small amount of this book, and you can clearly see there is so much more to experience from it. After reading this book, I think everyone should read it. It puts us in the middle of everything during WWII, in London and in the war zone on the island of Malta, allowing us to safely experience exactly what war is like whether we want to or not. Your heart's compassion truly goes out to these characters as they fight and fought at times to stay alive. Perhaps if more people read this book, the people who think war is the answer to problems at times, those very same people who have never experienced war, this book will surely change their minds about it as they read the words that are the reality of war. Perhaps those people may think differently when it comes to deciding whether a war should be fought or not, or one can at least hope. I truly believe in time this book will become a classic and maybe even required reading in High Schools one day. I would love to see both of these things happen with this book. This is quite the book! Again, BRAVO!!! I won this book in a giveaway from Goodreads, and I truly want to thank them for choosing me to read and review this book for them. I received the print version of this book from them which I say thank you so much! This book will hold a special place on my bookshelf. I will be rereading this book again at a later date because I know I will get even more out of it from a second reading. Great review! I've seen this one a lot of people's top lists for the first half of the year and your review is no different. Definitely need to pick this up!! Thanks for the compliment about my review for this book! Yes! This was quite the book! I really felt like I was there the way this author described everything. He is an excellent writer! You get so pulled into the story as you are reading along, you swear you can smell the smoke from the bombs, feel the earth moving when the bombs hit the city or the island, you could taste the sand in your mouth and feel the scratchy eyes from the sand that got in them on the island, as well as the severe hunger the London soldiers suffered from on the Island of Malta. I do have to admit that before I started to read this book, I was worried and maybe a little apprehensive about whether I would like this book or not because it is about war, but no! I LOVED this book! The author's writing is so good, and there was so much that happened in the book that it addressed so much about the war. There were things in it I never learned in school, such as how the people in London suffered from all the bombing, etc. One thing I wished I DID add to the review was the part that WE, the US, was not YET involved in the war until the end of the book when we moved into London. I will read this a second time around, but later. I'll let what I read sink in and pick it up again. It's worth a second read through because the first time, just like when you watch a movie the first time, you miss a lot. I know I may have missed some things, and might understand others now that I know more history about it. I look forward to reading it again! Thanks for stopping by! Enjoy this book when you go to read it! I KNOW you'll love it just as much!